“By contrast with Catholic thought [described by the author as ‘linear’: “Salvation is something other than creation, and the human undergoes change as … he or she is transformed”], the essence of Lutheranism is that it is structured by a dialectic. There are two ways in which a human being can live: the one is to be designated ‘faith’, the other ‘sin’. Nor is it — unlike the linear structure of Catholicism — that the human can move from the one situation to the other while keeping the self intact, as though ‘nature’ were to be transformed by ‘grace’. On the one hand there is the stance of faith, in which a human looks wholly to God, basing himself ‘outside’ himself in God. On the other, there is sin, in which the human, wrapped up in himself, attempts in and of himself to be good enough for God. The stance of faith represents both salvation and creation, since salvation is the recovery of the relationship to God intended by the creator. The movement from sin to faith is a revolution and takes place through repentance and the recognition that the attempt to come to oneself apart from God was futile. Life is not to be conceived as a via for our inward change and the Christian looks not to something about the way he is but, rather, simply to God in whom he trusts” (Hampson, Christian Contradictions, 2-3). How odd, I randomly picked this book from the shelves at the library right about the time I started reading this blog. From a Catholic perspective though I can say that she seems to misrepresent or misunderstand the “mind” of Catholicism—so often as she stated the supposed Catholic mindset on a topic I would be left scratching my head, “Oh that’s what I believe, eh?” I will dig through the book and try to find specific examples. Looking forward to your commentary on the book! Ben, I would agree that from a scholarly perspective, Hampson’s ‘affiliations’ are moot. One could argue that her independence from both camps enables her to give perspectives not afforded to those of us with more vested interests. Your thoughts on her treatment of the Catholic structure of thought would be very welcome. I find her analysis of Lutheran dialectic to be interesting. First is the existential nature of it, involving one’s sin and one’s faith. And yet, there is a complete lack of a dynamic element that we would see reflected in Scripture, e.g. spirit/flesh, old man/new. Her dialectic is existential and yet not existential. 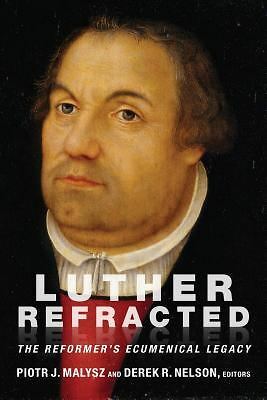 It seems to be an amalgamation of the essentially un-existential (being that it is defined from God’s perspective), objective understanding of Luther’s simul. And connects it with the nature of human existence. It holds on to the objective sin/forgiveness of Luther’s simul, brings it into the existential, and then gets rid of the utterly dynamic aspects of human existence as we see in our own lives and reflected in Scripture. I hope I explained this clearly. What are other people’s thoughts? This was just my gut reaction to reading this. P.S. I will be posting some analysis of the use of Luther’s simul in Lutheran theology in the context of sanctification on my blog: A Lutheran Beggar. P.S. By interesting, I don’t mean in a good way. I began to look into your question of Hampson’s use of existentialism in regards to the Lutheran dialectic. I have to recommend first of all that you read the entire first chapter of her book. Based upon my browsing just now, she does hit upon more thoroughly the existential element in Luther’s theology, especially in reference to his Large Catechism (when he responds to the questions ‘What is it to have a god? What is God?’) and in his theology of the presence of Christ in the sacrament. She says that Luther’s epistemology is an existential one, “in the sense that that in which I trust is ‘God’ for me. We are at the polar extreme from a philosophical theology in which I should (in abstraction from myself) commence by asking after the nature and properties of God” (21-22). Further, she prefaces her analysis of Luther’s simul justus et peccator by writing, “As we have seen, the Christian lives by Christ’s righteousness, a righteousness which is extrinsic to him. Thus he is, at one and the same time, both a sinner (in himself) but also righteous (in that he lives by God’s righteousness)” (24). To me that pretty well summarizes Luther’s position (while she goes on for a couple more pages discussing the dynamic). I have to say, I read 75% of her book a year ago (I still need to read the final chapter on Kierkegaard) and I felt that her chapter on Luther’s thought was one of the best summaries I have ever read. I felt she got it (obviously without taking it on board in her own life which doesn’t exclude her ability to “get it” in a scholarly way). I might be wrong though.